Home » Website Building » SEO » How to Add Google Analytics Code Using PHP Implementation? 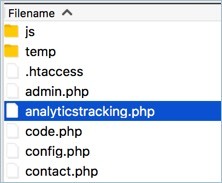 How to Add Google Analytics Code Using PHP Implementation? Google Analytics is the top most and free web analytics tool offered by the search engine giant Google. You can implement the script in the header section of the pages to track the hit count and other user behaviors. Google also offers PHP implementation method to add Google Analytics code on any web page. In this article we will explain how to add Google Analytics code using PHP implementation method. When to Use PHP Implementation Method? Generally the website tracking code of Google Analytics can be used directly on most of the content management systems like WordPress. But there are PHP websites which may not have an option to insert the UA code. In such a case instead of inserting the complete script it is a good idea to use single include line using PHP implementation method. Remember, you should use PHP implementation only on the sites using PHP pages. Sites having plain HTML or using frontend framework like Bootstrap should have the Global Site Tag and can’t use PHP implementation. Login to you Google Analytics account and navigate to “Admin” section. Analytics has three component for each site – Account –> Property –> View. Select the “Account” and then “Property” you wanted to implement PHP tag. Click on the “Tracking Code” option under “Tracking Info” section. You will see the tracking ID and the website tracking script, Global Site Tag (gtag.js). Normally, you can use this script as it is or insert the tracking ID on your site for adding Google Analytics. Learn more on how to create tracking code for your site. Copy the “Global Site Tag” script under “Website tracking” section text box. Open Notepad in your PC or TextEdit in your Mac and create a new plain text file. Paste the script code in the text file and save the file with the name as “analyticstracking.php”. Remember to save the file with .php extension. Login to your server using FTP or File Manager option in cPanel. Upload the “analyticstracking.php” file into the root directory of your site. Now open your webpage’s PHP template and insert the following code immediately after the < body > tag. Generally the code is to be inserted only on the “header.php” template file. As this file will be called on all pages of your site, the tracking code will be automatically inserted in header section of all the pages. If you don’t have “header.php” template file then you should add this code on all page templates of your site. Save your changes and upload the files back to the server. First open one of the pages on your site in web browser. Right click on the page and view the page source. You should be seeing the Google Analytics tracking code on the source code. The above worked perfectly for me. Many thanks. This was my first experience with a PHP website and I didn’t realise I had to insert more than just the UA code. My experience prior to this was only with WordPress sites so the above was a bit of a new learning curve. But I just followed the above steps and it worked out smoothly. Thanks for telling me this method I eagerly want to know the method How to Add Google Analytics through PHP file and I got the solution here. It is the alone article in Google Search to add the proper way. You can get reporting from Analytics dashboard, this is the same for any type of implementation. We already created a php file as you mentioned in the article. But the code is not working . May i know the updated ones. We are using in PHP sites and it works properly. You should check the correctness of the code from your Analytics account and use the PHP tag right after body tag. We checked thoroughly, but the 5th point which you mentioned in your article is not implemented in my site. That is only my problem. Read the section – when to use PHP implementation method. Looks your site is pure HTML site and not parsing PHP. In this case just insert the complete Analytics tracking code in header section of all your pages, then it should work. It’s not a modified code, it’s the same Global Site Tag tracking code. You should create a PHP file and use the tag as explained in the article. Screenshots in the articles are updated with the latest Analytics interface.